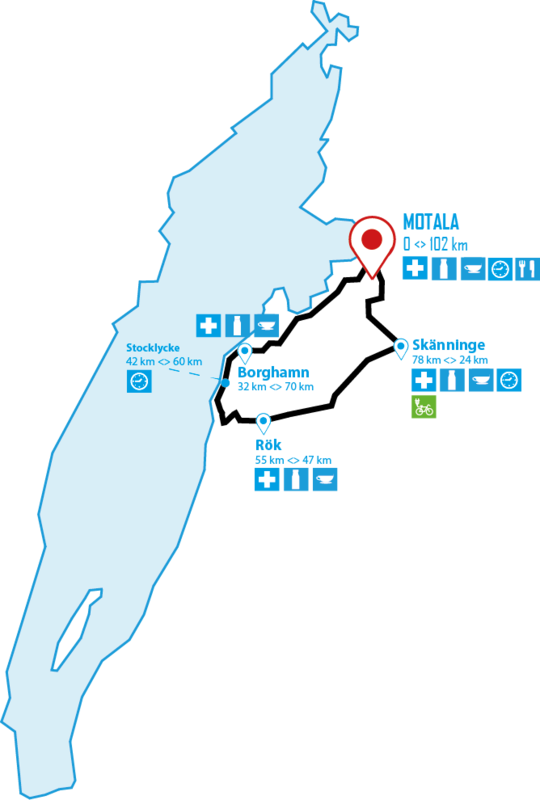 The 100 km course of Vätternrundan 100 km is the same as the Tjejvättern course. Initially, you cycle south from Motala, through Vadstena and the scenic (and quite demanding) hills of mount Omberg before returning over the rapeseed of Östgötaslätten by Rök and Skänninge. The course is very beautiful, varied and challenging for both new and experienced cyclists. Just before the hill on mount Omberg. Home of the famous runestone, with the world’s longest runic inscription, and a popular rest stop at the half way mark. Beverages, buns and bananas. The service depot is located in the heart of the medieval town of Skänninge, more specifically in the square. If you are running short of energy, or just feel curious about trying an electric bike you can borrow one from our partner Crescent for the last ride to the finish in Motala. Note: There is a limited number of electric bikes that you can borrow, it´s “first come first served” rules that applies. Follow the signs at the entrance of the service depot. Those who want to drive past the depot, keep to the middle of the right field. Make sure to signal if you want to turn.